Rheumatoid arthritis (RA) is a long-term disease. It leads to inflammation of the joints and surrounding tissues. It can also affect other organs. The cause of RA is unknown. It is an autoimmune disease. This means the body's immune system mistakenly attacks healthy tissue. It is much less common than osteoarthritis, which is a condition that occurs in many people due to wear and tear on the joints as they age. RA most often requires long-term treatment. Treatment includes medicines, physical therapy, exercise, education, and possibly surgery. Early, aggressive treatment for RA with newer drug categories can be very helpful to slow joint destruction and prevent deformities. These drugs work well to reduce pain and swelling. Long-term use can cause stomach problems, including ulcers and bleeding, and possible heart problems. They may be given when other medicines for rheumatoid arthritis have not worked. Sometimes biologic drugs are started sooner, along with other rheumatoid arthritis drugs. However, because they are very expensive, insurance approval is generally required. Most of them are given either under the skin or into a vein There are different types of biologic agents. Some people may benefit from taking part in an arthritis support group . How well a person does depends on the severity of symptoms and the response to treatment. It is very important to have regular return visits to the provider, who will adjust treatment to control the arthritis. Permanent joint damage may occur without proper treatment. Early treatment with a three-drug DMARD combination known as "triple therapy," or with the biologic drugs, can decrease joint pain and damage. These drugs are given by specialists called rheumatologists. Call your health care provider if you think you have symptoms of rheumatoid arthritis. There is no known prevention. Smoking cigarettes appears to worsen RA, so it is important to avoid tobacco. Proper early treatment can help prevent further joint damage. McInnes IB, Schett G. The pathogenesis of rheumatoid arthritis. N Engl J Med. 2011;365:2205-2219. PMID: 22150039 www.ncbi.nlm.nih.gov/pubmed/22150039 . O'Dell JR. Rheumatoid arthritis. In: Goldman L, Schafer AI, eds. Goldman's Cecil Medicine. 25th ed. Philadelphia, PA: Elsevier Saunders; 2016:chap 264. O'Dell JR, Mikuls TR, Taylor TH, et al. Therapies for active rheumatoid arthritis after methotrexate failure. N Engl J Med. 2013;369:307. PMID: 23755969 www.ncbi.nlm.nih.gov/pubmed/23755969 . Singh JA, Saag KG, Bridges SL, et al. 2015 American College of Rheumatology guideline for the treatment of rheumatoid arthritis. 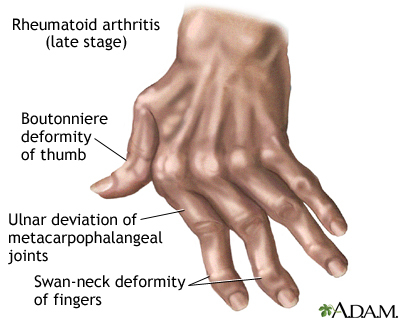 Arthritis Rheumatol. 2016;68(1):1-26. PMID: 26545940 www.ncbi.nlm.nih.gov/pubmed/26545940 . Sweeney SE, Harris ED, Firestein GS. Clinical features of rheumatoid arthritis. In: Firestein GS, Budd RC, Gabriel SE, McInnes IB, O'Dell JR, eds. Kelley's Textbook of Rheumatology. 9th ed. Philadelphia, PA: Elsevier Saunders; 2013:chap 70. Most of us expect to become a little achy and creaky as we get older. It's because the cushion that protects our joints wears down over the years, a condition called osteoarthritis. But some people develop a form of arthritis at an earlier age, not because their joints are wearing away, but because their body is attacking and damaging their own joints. Let's talk about rheumatoid arthritis, or RA. The immune system normally keeps the body safe against bacteria, viruses, and other harmful invaders. But sometimes this system goes a little haywire, and the body mistakenly attacks its own tissues. That's known as an autoimmune disease. In the case of rheumatoid arthritis, the immune system attacks and damages your own joints. Like other forms of arthritis, rheumatoid arthritis makes the joints painful and stiff. If you have RA, you may notice that your joints feel stiffer in the morning, making it hard to get out of bed. Over time, you'll have trouble moving the affected joints, which can become deformed and bent out of shape. So, how do doctors diagnose rheumatoid arthritis? Well, there isn't one test that can tell for sure that you have RA. However, there are a couple of lab tests that can point your doctor to the diagnosis. You may also have an ultrasound, MRI, or x-rays so your doctor can see what's going on inside the affected joints. If you do have RA, many drugs can treat it. However, each of these drugs can have some side effects, and some of them are serious. You'll have to decide with your doctor which drug to take by weighing the benefits against the risks. If you're like most people with RA, you'll start by taking medicines called disease modifying antirheumatic drugs, or DMARDs for short. These include methotrexate. Often antimalarial drugs are given along with DMARDs. Anti-inflammatory medicines such as ibuprofen, naproxen, and celecoxib can help bring down the swelling in your joints. So can steroid drugs. If these medicines don't work, your doctor may suggest trying a biologic medicine, which targets the overactive immune response that's damaging your joints. Biologics are usually injected under the skin or into a vein. Severely deformed joints may need to be treated with surgery to remove the joint lining or even totally replace the damaged joint. Whatever treatment you use, also remember to exercise your joints on your own, or by going to a physical therapist. The right exercise can help keep your muscles strong and improve your joint mobility. When you have RA, don't try to overdo it. Think about your achy joints before doing any activity, so you don't overstress them. Also follow your doctor's treatment advice carefully. If you let this disease go, you could end up with permanent joint damage that can't be reversed. By treating RA early, you can get your joints, and the rest of you, moving more smoothly again. Rheumatoid arthritis is another form of arthritis. The body’s own immune system attacks a joint’s synovial membrane, which secretes fluid and lines the joint. 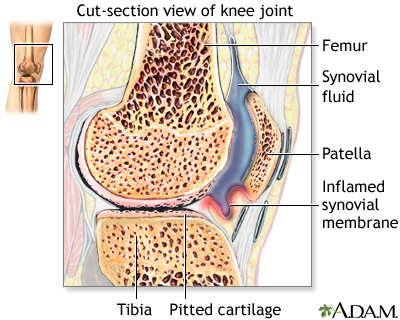 The synovium becomes inflamed, produces excess fluid, and the cartilage becomes rough and pitted.